Alright, let’s not get ahead of ourselves here. Calling matcha tea a miracle might just be a tad bit excessive but when it comes to tea, its certainly the closest thing we have to a miracle. Matcha is by no means your run-of-the-mill green tea. It is not only popular among health-conscious celebrities but is also praised by top nutritionists and highly recommended by health experts. For centuries, the Japanese have used this high-grade, finely ground, concentrated green tea for traditional tea ceremonies. 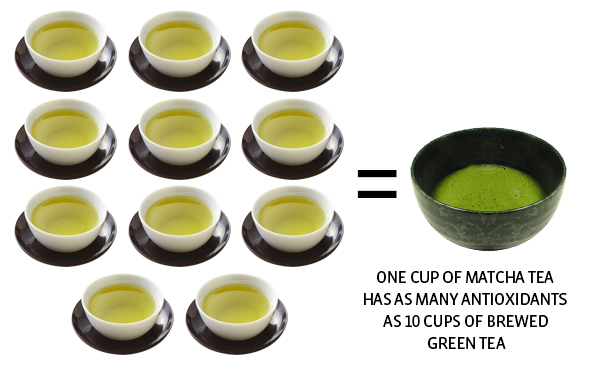 What’s the secret behind matcha’s super strength? The answer lies in its polyphenol compounds called catechins, a type of antioxidant found in superfoods like green tea, cocoa and apples. Due to its rich catechin content, matcha green tea provides amazing health benefits to regular drinkers. A more beautiful you – Matcha green tea contains antioxidants such as epigallocatechin gallate (EGCG), which may help support skin health by reducing inflammation and free radicals that accelerate skin ageing, leaving your skin looking youthful and glowing. A fitter you – Research has consistently shown green tea to be highly effective in increasing metabolism and accelerating fat loss. Matcha tea in particular is much more potent than regular green tea, with one cup being equivalent to drinking 10 cups of regular green tea. In one study, it was found that the compounds in matcha tea can boost your body’s ability to burn calories by 4-5 times. EGCG, found in high concentrations in Matcha, has been shown to increase the rate of burning stored fat as energy, as well as decreasing the formation of new fat cells. A younger you – DNA oxidation is thought to be one of the causes of ageing in the human body. Matcha has a high concentration of antioxidants, which research has shown to have amazing protective effects against oxidative stress in the body. One study found that Matcha has 137 times more antioxidants (notably, epigallocatechin gallate (EGCG)) than regular green tea. This is tremendous anti-ageing power in a single cup of tea. A more energetic you – Due to its high L-theanine content, matcha is a great energy booster that keeps you going. Perfect for those long and demanding days at the office. A calmer you – Whilst boosting energy levels, L-theanine in matcha also helps with calmness and stress management. L-theanine has been shown to benefit patients diagnosed with anxiety by increasing levels of dopamine and GABA in the brain. A sharper you – L-theanine helps to focus the mind, enabling one to think more clearly and effectively. The L-Theanine in green tea is known to help stimulate alpha brain waves. By drinking matcha you can increase your levels of L-theanine and promote alpha waves, which lead to a state of relaxed alertness. A healthier you – A 2011 study in the American Journal of Clinical Nutrition showed that the catechins in green tea had a significant effect on lowering LDL cholesterol. A 2013 Cochrane review also showed that regular green tea consumption was associated with lower blood pressure and an decreased risk of stroke. Our experts recommend using matcha to make a delicious cup of tea or variety of smoothies. To make matcha tea, just add 1-2 tsp. of the powder to a cup using a small sifter. Then add 60ml hot water or milk. For best results, use water just under a boil. Whisk vigorously in a zig-zag motion until the tea is frothy and add honey to sweeten if necessary. For a simple matcha smoothie, blend one-inch banana slices with 1 cup of milk (almond, cashew, or regular milk are fine), 5 ice cubes, and 1 tsp. of match powder together. Our experts also recommend using matcha powder in your baking in order to get more of its nutrients in your daily diet. Due to high pollutant levels in some forms of matcha, we strongly recommend purchasing the Japanese variety which is usually purer and better prepared. We will be stocking a tried and tested brand of matcha tea in the coming weeks and will alert our readers when they become available at our physical and online stores.